The very, very long train I rode last night — the end cannot be seen in this picture. Yesterday was a strange mix of a day! It began with a very bumpy and exciting downhill ride in what’s called a “tuk-tuk.” These are small, open, 3-wheel vehicles a lot like a golf cart. I made arrangements the day before for a tuk tuk driver to meet me when it was time to leave my rental and take me to the train station. Truth is, what I really needed was help with luggage. The idea of climbing up the 111 steps with my bags didn’t appeal! So, with me in the backseat with open air all around, we first went to the top of the highest hill in town, then zoomed down and around curves until in about ten minutes we were at the station at the waterfront. It really was kind of fun! 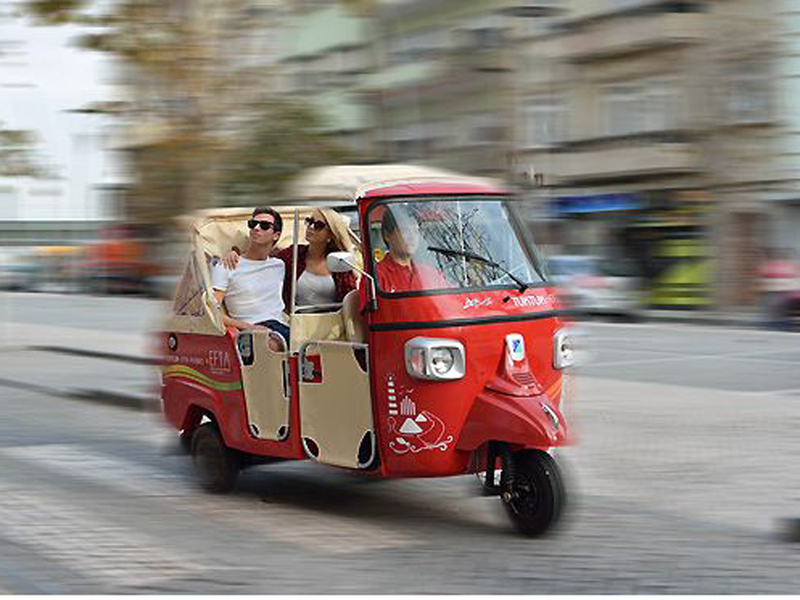 This picture of a tuk tuk is borrowed from visitportual.com. I hope no one minds. Then my day became really boring because I had to wait in the station for more than ten hours for the train. 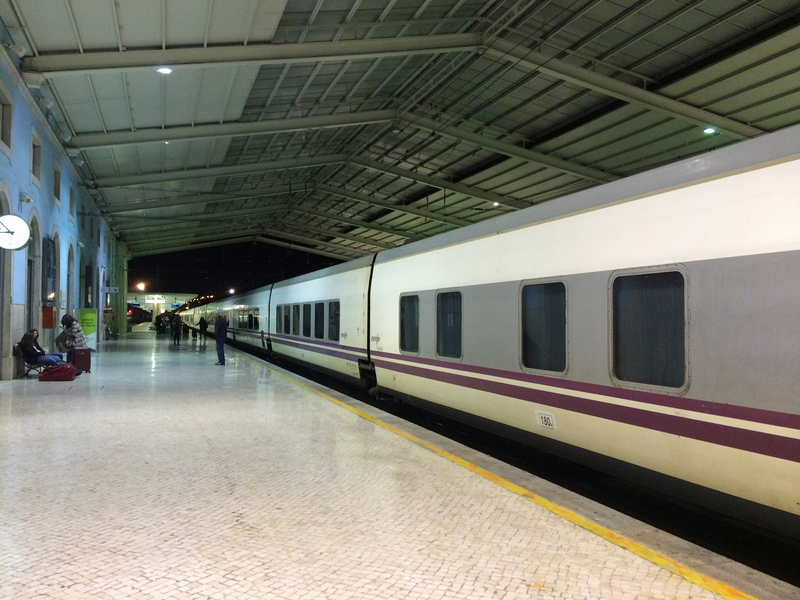 It was an overnight train from Lisbon to Madrid. Before leaving home I had booked a berth in a 4-females room. Without realizing it I’d arranged for an upper berth – one that I really didn’t think I could manage. 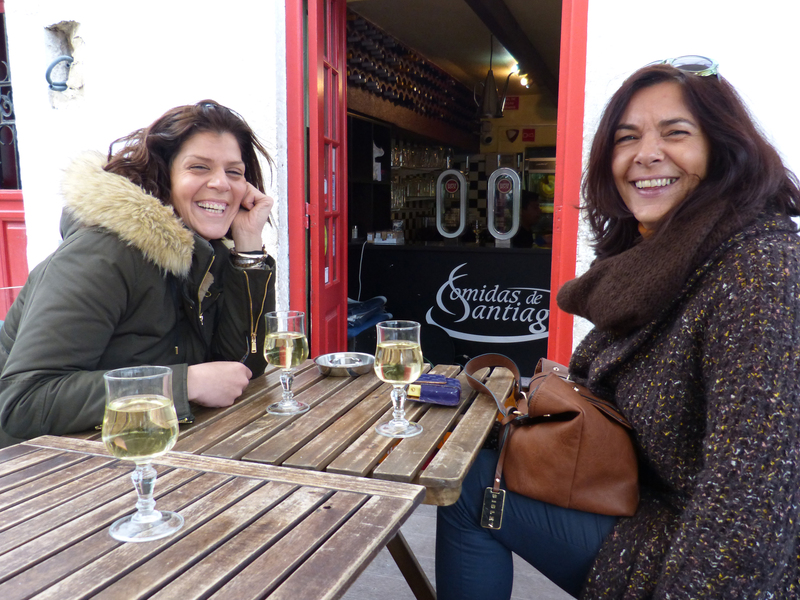 My roommates were a mother and her young adult daughter from Brazil who were touring Portugal and Spain for two weeks with two humongous suitcases, and a young woman from Switzerland who had been studying in Lisbon for six months. She was kind and switched bunks with me so I didn’t have to figure out how I could get out of a top bunk in a very small, very crowded space. 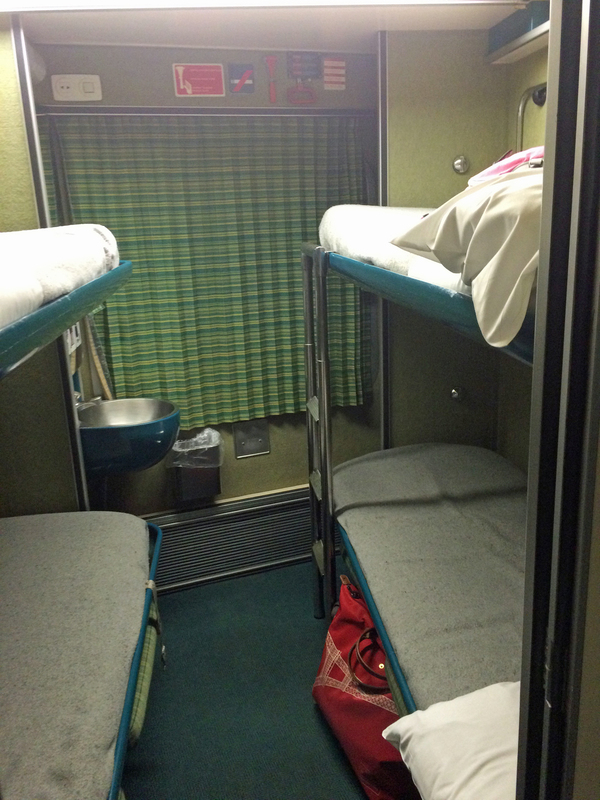 Here are my deluxe accommodations on the train — shared with three other women. This was a very long train. It rattled and shook all night – I thought rails must be missing here and there. It felt a lot like being on the Star Clipper, the sailing ship I sold cruises on, though the ship was usually much smoother and very much quieter. Periodically the train stopped for a few minutes – presumably to let another train have the right of way though I never heard one pass up during those stops. Around 7:00 I woke up but everyone else was still sleeping so I lay there in the dark, keeping quiet, until the porter knocked on the door just before 8:00 and let us know it was time to get up. There was no way I could move in that room! The train arrived in Madrid at 8:40 and that’s where I am now! Madrid is a beautiful city. I’ll be here only a short time and I’ll tell you about it tomorrow. 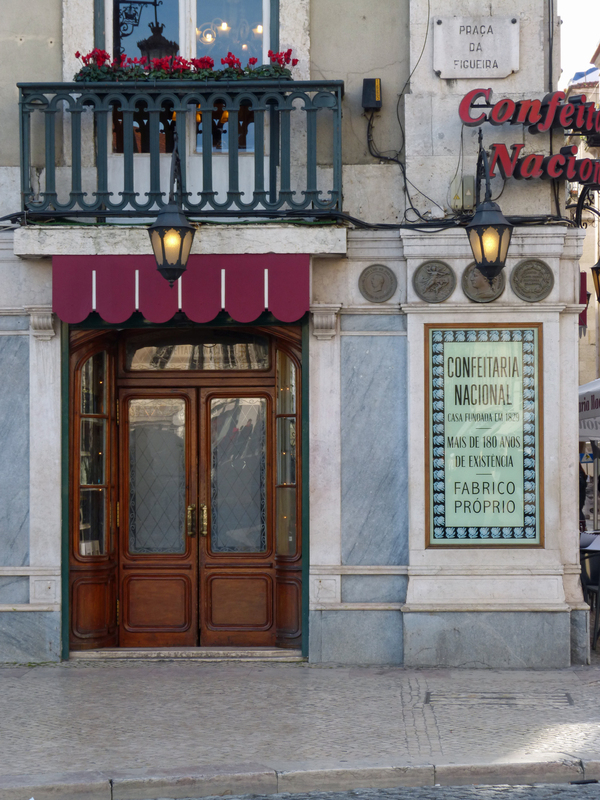 In the center of Lisbon, just east of the rectangular post-earthquake block of commercial streets that I’ve written about already, there’s a busy area called Rossio. Rick Steves’ book Snapshot Lisbon calls this the “center of town” and says it’s built around a Roman racetrack (actually, there appear to be two of these long oval spaces.) I found a number of delightful sights to share with you. An old-fashioned jeweler’s shop, still going strong. 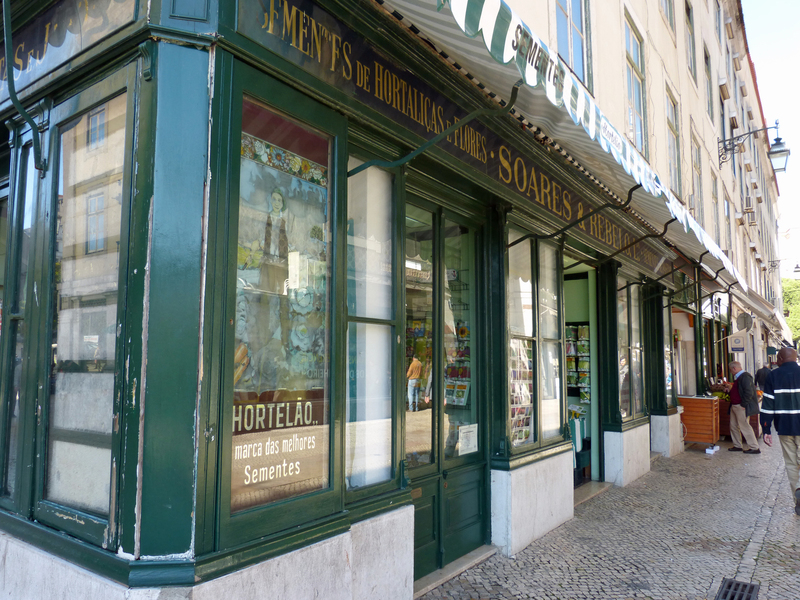 One of the oldest pastry shops and cafés in Lisbon. Notice the pretty door. 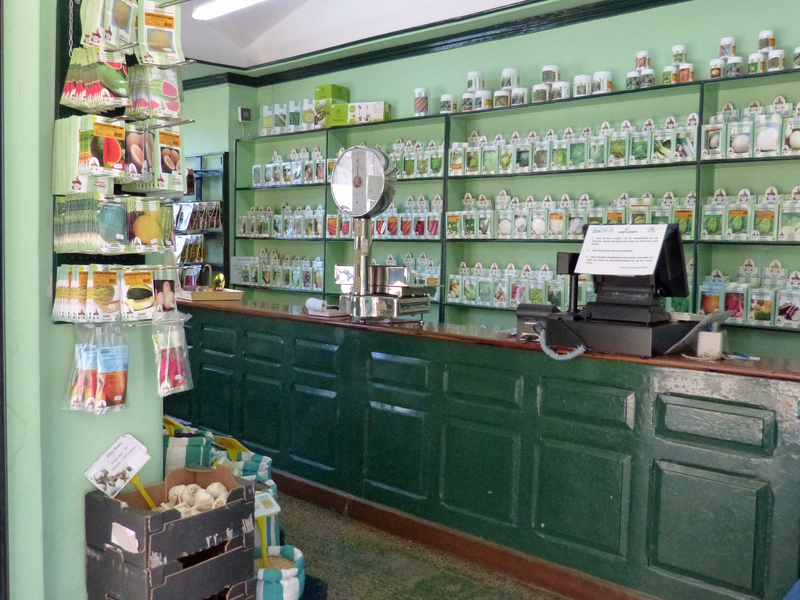 The exterior of a small shop selling only seeds, located on a busy (high rent) corner. I sneaked a quick peek and a shot to show you the wall-to-wall spring seeds. I wonder what they do the rest of the year. 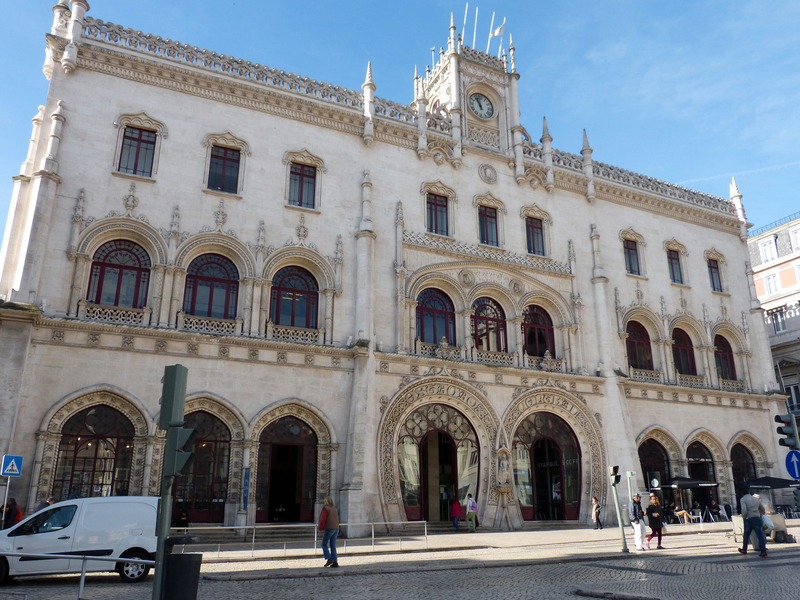 I went to the Rossio railroad station – actually, this whole area seems to be referred to as “Rossio.” It has an interesting purely-Portuguese facade. A broad avenue begins just above the station, in an area called Praca dos Restauradores where there’s a Metro station of the same name. 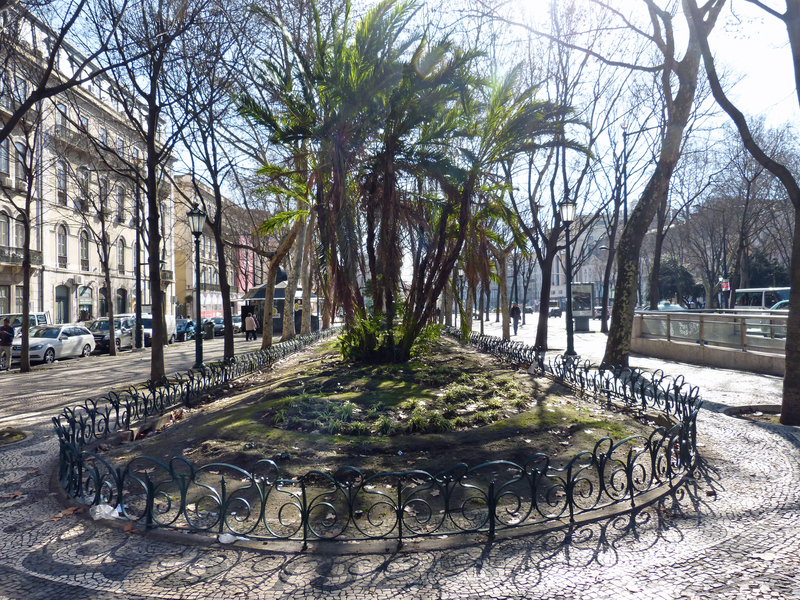 This seems to be where “the other half lives.” Avenida da Liberdade is a street very reminiscent of Paris: 8 lanes wide with two boulevard strips of maple trees and water features. It’s lined with theatres, offices, and apartment buildings which seem to date from the late 19th century through the 70’s or 80’s. This street (or so I’ve read) was begun following the 1755 earthquake but was originally restricted to the aristocracy. I think today’s boulevard dates from the 1880s and is very influenced by Paris. I suspect anyone with money could enjoy living there now. Here’s just a peek at one of the narrow boulevard parks. There are two of these boulevard spaces, each with a pond or fountain and tropical trees running up this avenue. Very fine apartment buildings line one side and you may notice the metro entrance on the right. 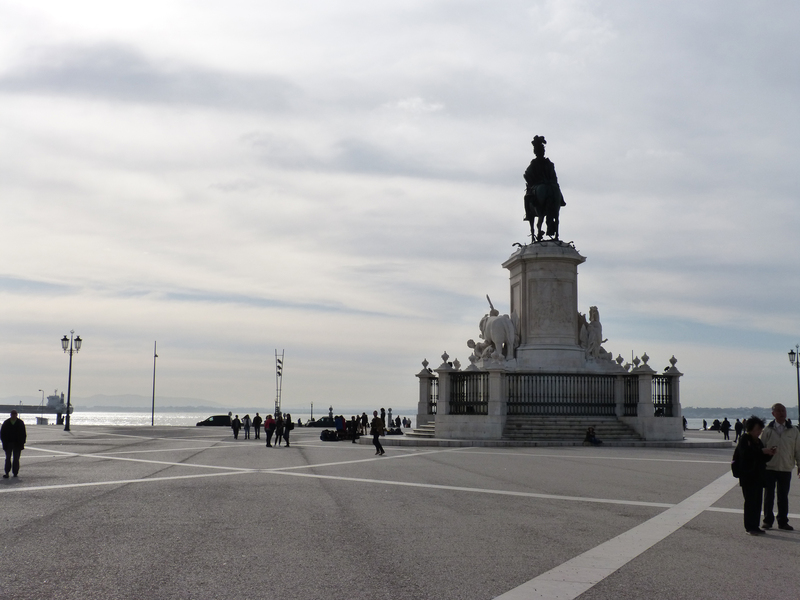 This is my last post about Lisbon. I’m taking an overnight train to Madrid, where I’ll enjoy a visit to what some people call the best art museum in the world, the Prado. Then on to Barcelona for a short visit. More soon. 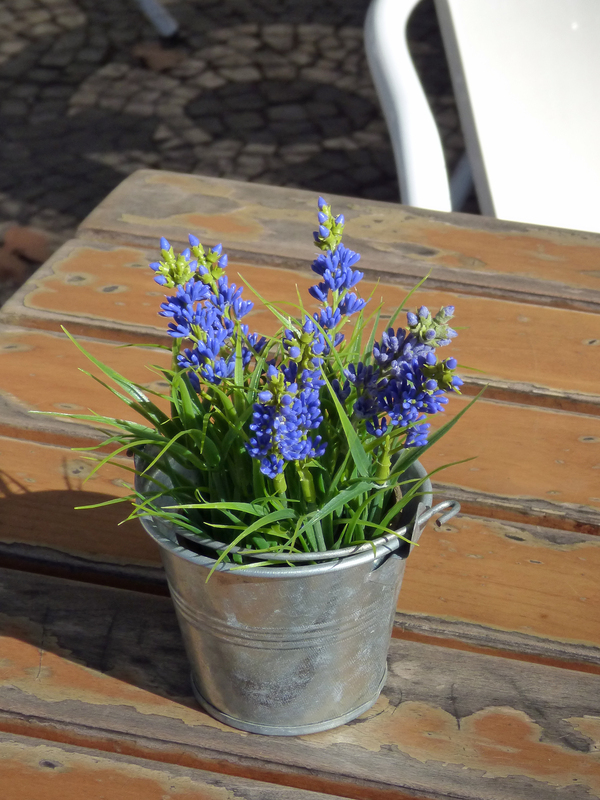 In the meantime, Happy Spring from Lisbon! I suppose because it’s Saturday I seemed to focus on shopping today – not my own but that of other people. 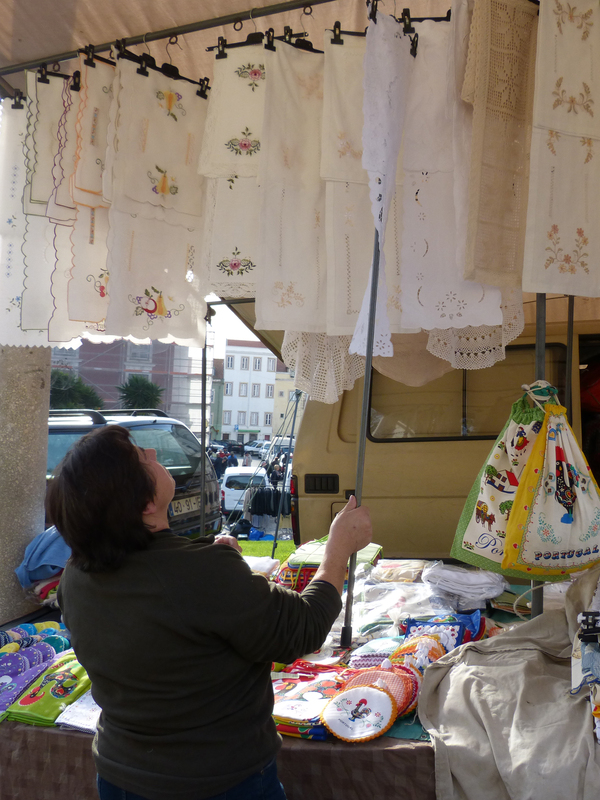 I had learned of a big flee market that happens every Saturday in Alfama and I was curious about it. It’s huge! The market is held beside and behind the two enormous churches which you can see in the picture taken from a spot just above my apartment. 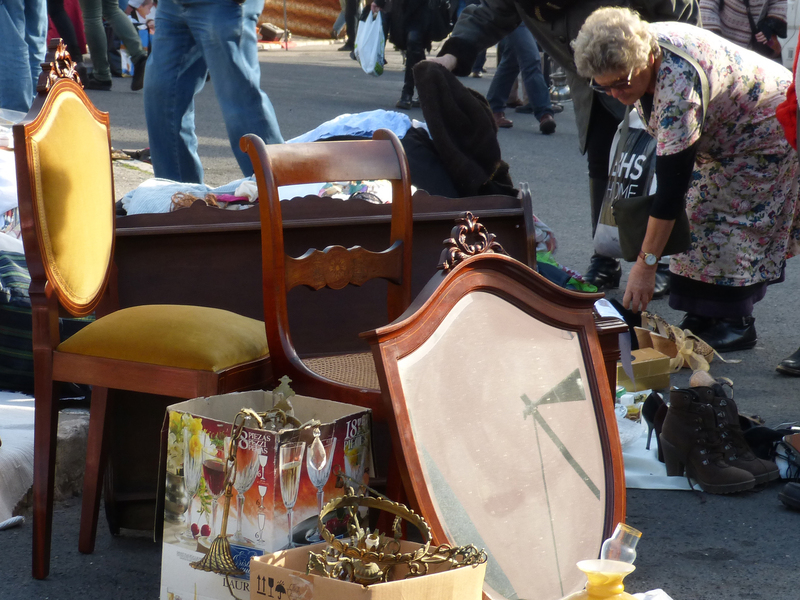 Here are a few of the pictures of the flea market. 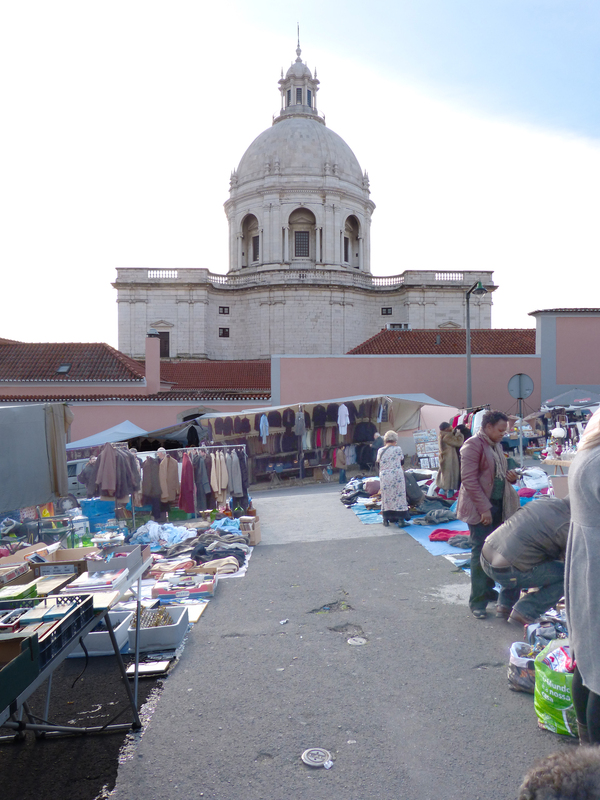 The flea market is located at the base of this church which is Portugal’s Pantheon. By the time I reached the back of the market I realized I was just a couple of blocks from the river – and flat land! 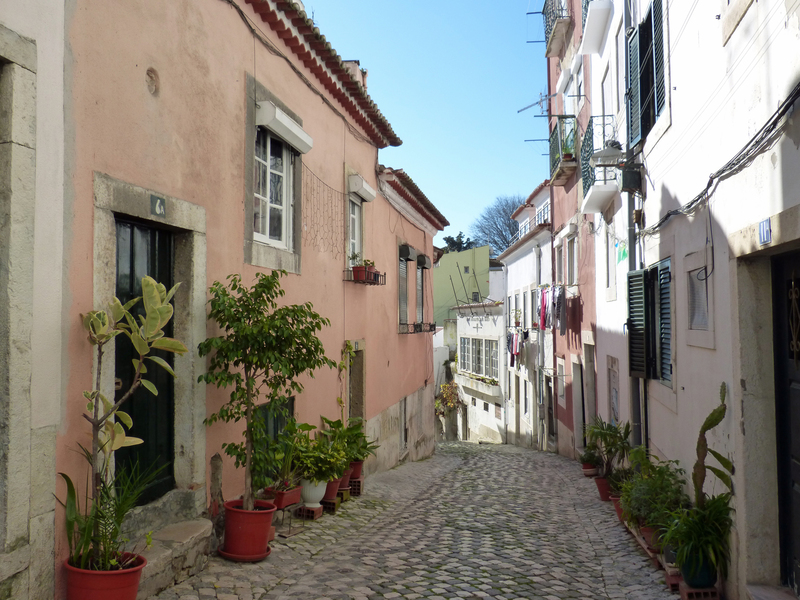 So I walked around the bottom of the Alfama hill and to the center of Lisbon, a distance of perhaps a mile. 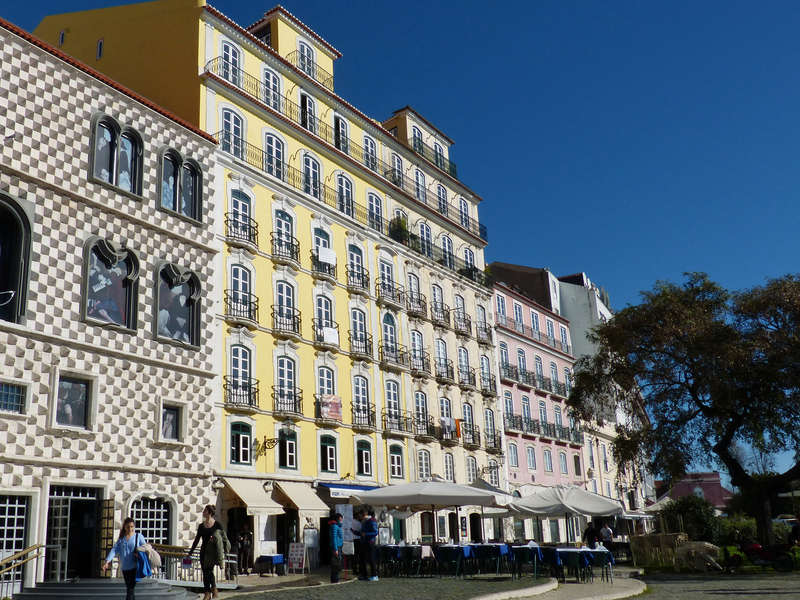 After the 1755 earthquake that flattened most of Lisbon the ruler of Portugal decided to build a modern city with straight, planned streets. Five parallel streets have formed the city center since that time. 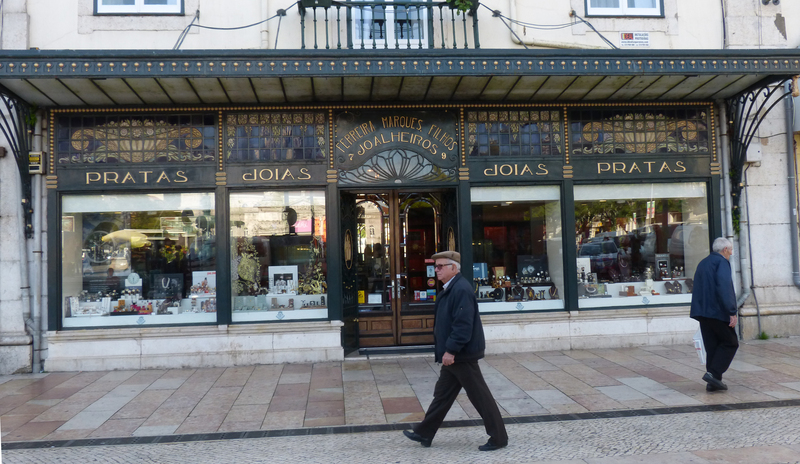 Upscale shopping in Lisbon is centered here. 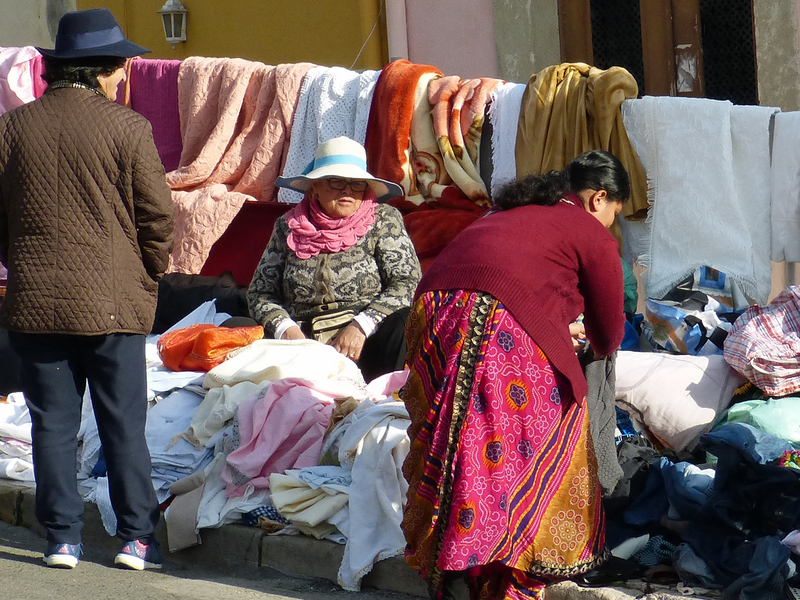 My day was split between bargain shoppers and fancy Lisbon shoppers. 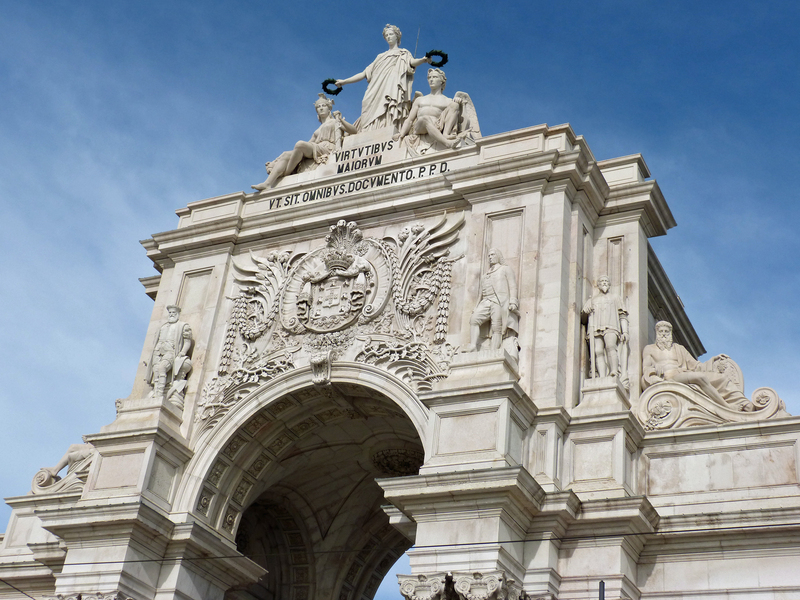 Magnificent 18th century buildings and the arch that forms their center constructed after the earthquake continue to be the centerpiece of Lisbon to this day. Let me show you! The magnificent arch and the buildings shown here comprise just one side of a huge square. Two other sides are lined in matching yellow buildings as are other buildings next to those in this picture that didn’t fit in my frame. Here’s a closer view of the top of the arch, which took over 100 years to complete. This is a view showing less than half of the enormous square that runs from the buildings shown above to the river. Here you see the center shopping street just inside the arch. Note the marble street and sidewalks. 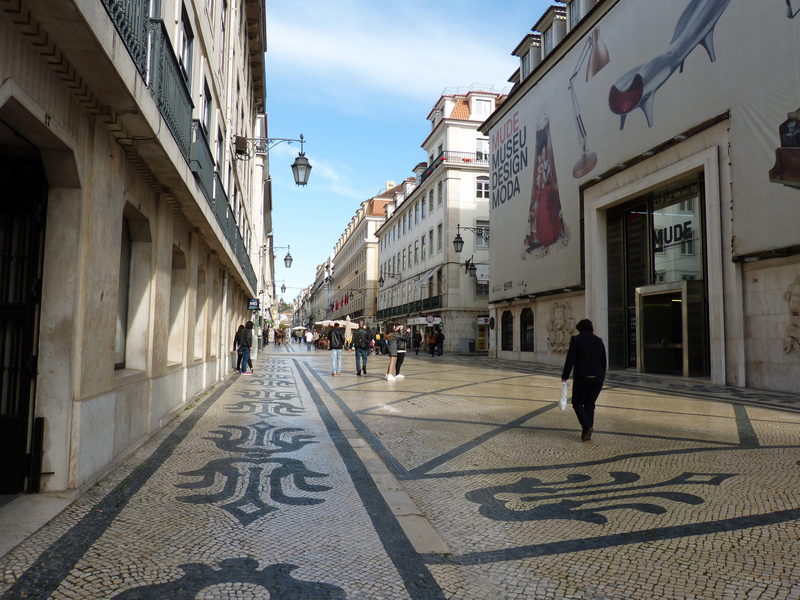 Lisbon’s very interesting sidewalks are pieced together like mosaics from black and white stone. 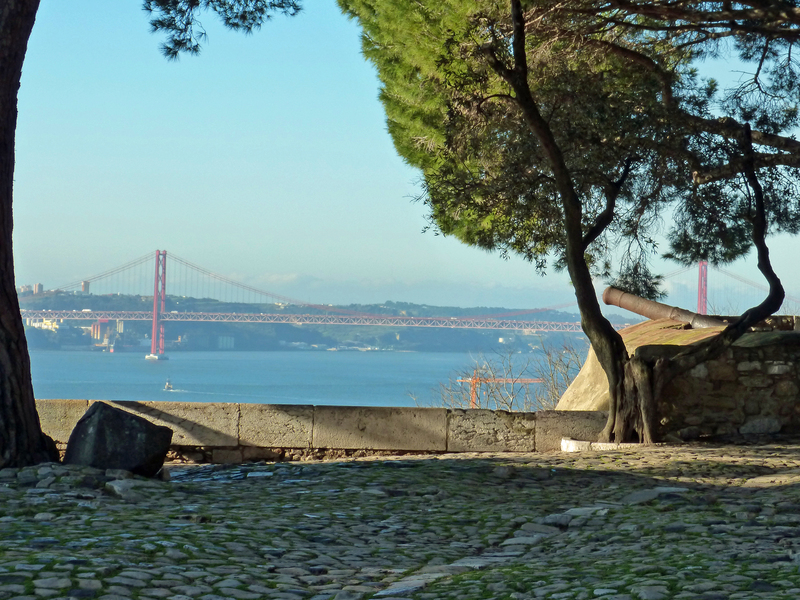 In mid-afternoon I met my new Lisbon friend, Marta, and a friend of hers and they took me to the highest point in the town to see their favorite view of Lisbon before joining me in a glass of wine and a most interesting conversation. This was an absolutely gorgeous day! The sky couldn’t be any bluer – the sun couldn’t be any brighter. 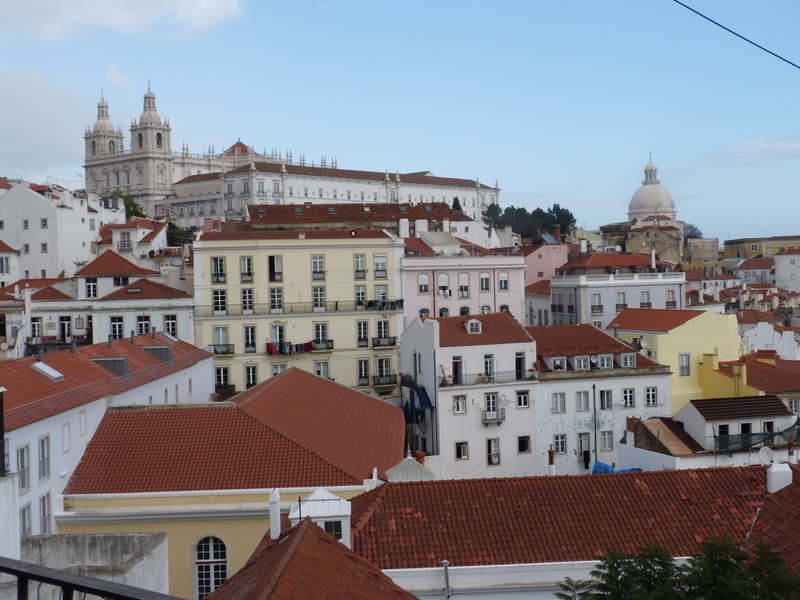 I spent the day exploring “my” neighborhood which is called Alfama. The houses here are hundreds of years old. Many of them are tiny apartments like the one I’m renting. The residents are a mix of older people who have been here forever and recent immigrants who are at the bottom of the pay scale. This area is popular with tourists and features many hole-in-the-wall businesses selling souvenirs. Today I’ve decided to show you quite a few pictures so you’ll see some of what I saw today! My days here begin with a 71-step climb to the street, but when the view at the top looks like this, as it did today, it makes me feel younger and ready to explore. 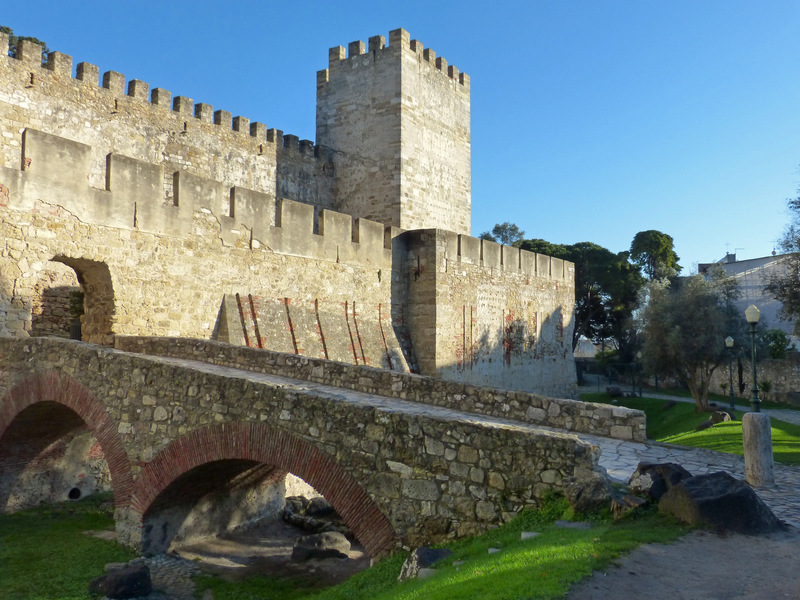 I began my day at the 11th century castle which is near my apartment but at the very top of the highest hill. There’s little left of this castle other than the walls — originally there was a small town inside the walls but it’s been gone for centuries. 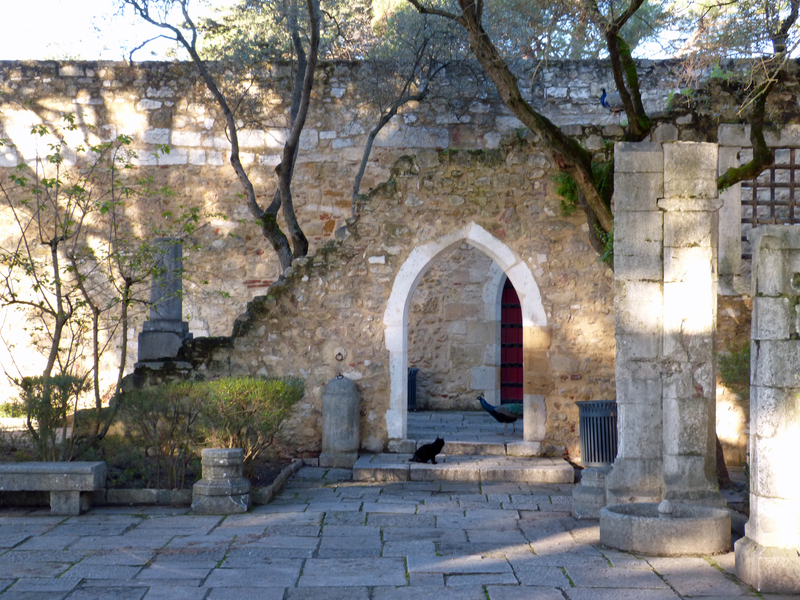 In the gardens of the castle there are many peacocks – and one black cat. (Look closely in the doorway.) I think the cat knows who’s boss! 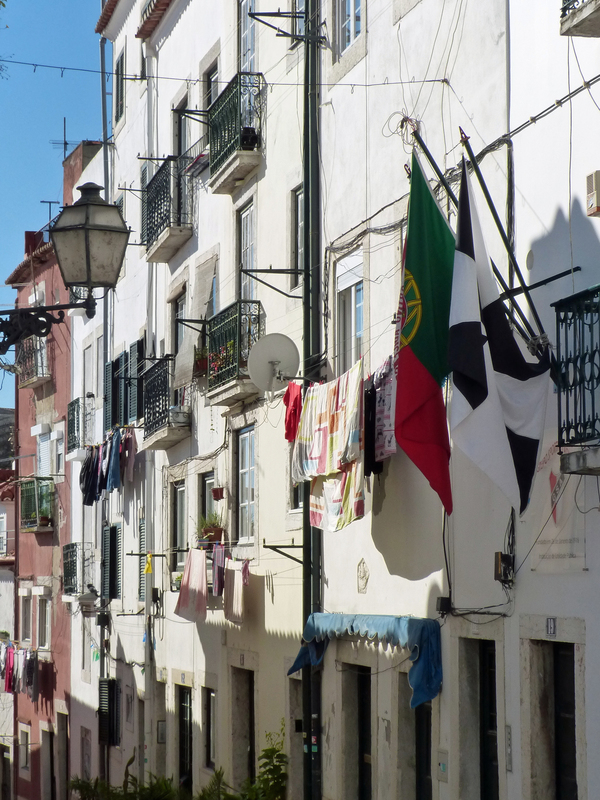 This scene is very typical of the neighborhood with clotheslines draped in wet laundry everywhere! The streets are cobblestones and sometimes they are quite uneven. I like the way the people in this pink house have made their home attractive. 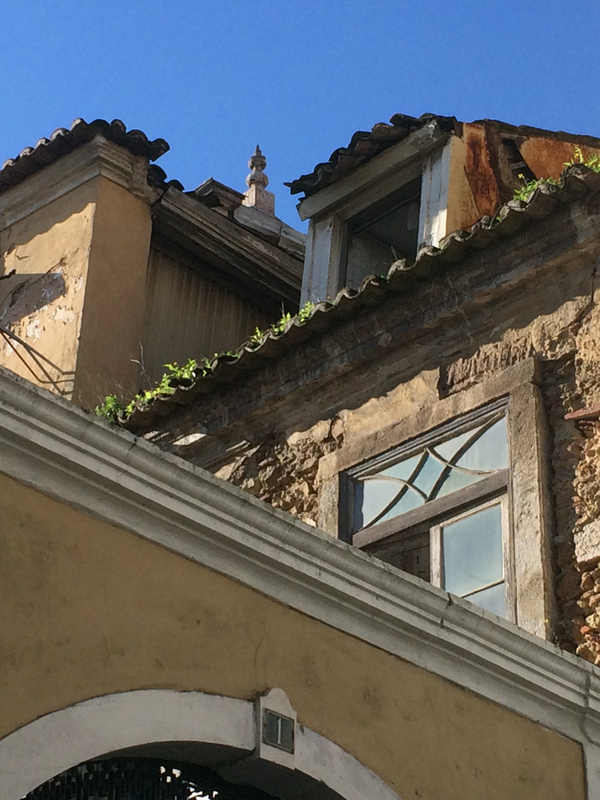 A close-up of a mix of rooflines that caught my eye. As I walked I saw many churches and the door on one of them was open so I stepped inside. A very friendly young man began a conversation with me which I enjoyed. 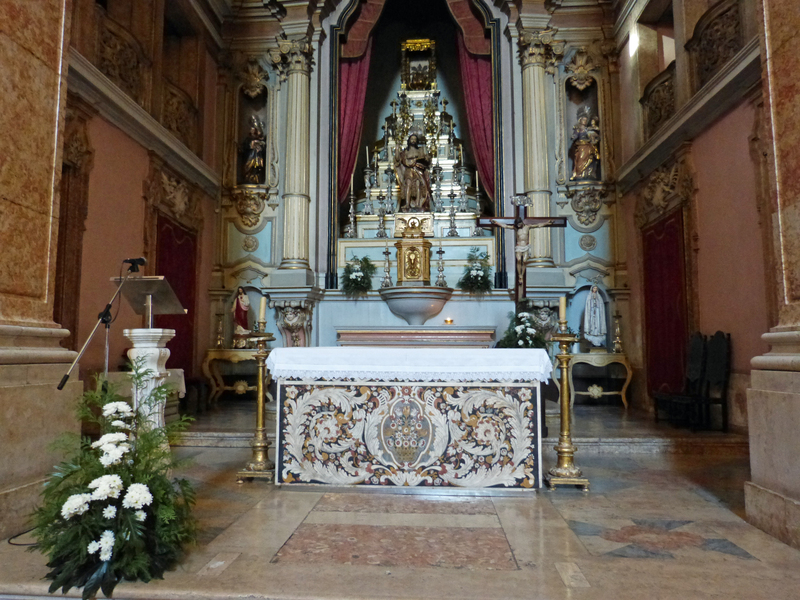 One of the things he told me is about this beautiful altar which he said is the only part of this church to survive the 1755 earthquake. That’s because it’s made entirely of stone – the design is not painted. 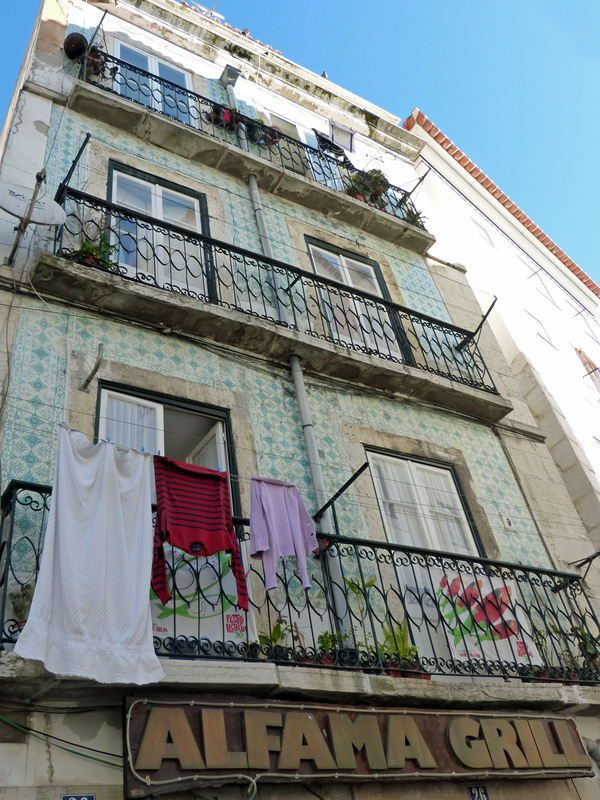 This is not the most charming of my pictures today but it may be the one that best represents the day: it names Alfama, it’s draped in laundry and it’s covered in tiles. Eventually I walked to the bottom of the hill where I found these lovely post-earthquake buildings near the new cruise-ship terminal. Pretty, aren’t they? The checkered one is actually covered in pyramids with their tops pointing out (the dark spaces). The building houses a foundation and gallery of a contemporary artist. Once I reached the bottom of the hill I was ready for lunch! 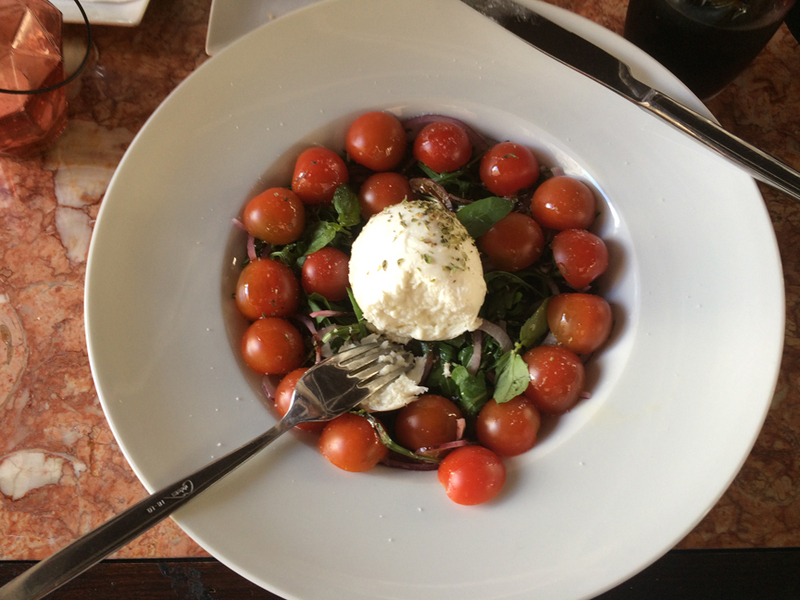 This lovely salad, based on the classic Italian mozzarella and tomato “Caprice” had the most amazing cheese ever. It was utterly fresh buffalo mozzarella, the freshest I’ve ever had. The waitress said it’s delivered daily. I returned to the apartment early but my day had begun early so I was ready for a break. Tomorrow I think I’ll ride the trams! I arrived in Lisbon last evening. Lisbon is one hour earlier than the rest of continental Europe so I get one more hour of sunlight at the end of each day! And that’s great because Spring has sprung here! Marta, a lovely young woman, associated with Olivier the manager, met me at the airport. She’s a good guide and she pointed out places and gave me lots of info (which went in one ear and out the other because I was so tired). She’s came back this morning and drove me around town a bit. 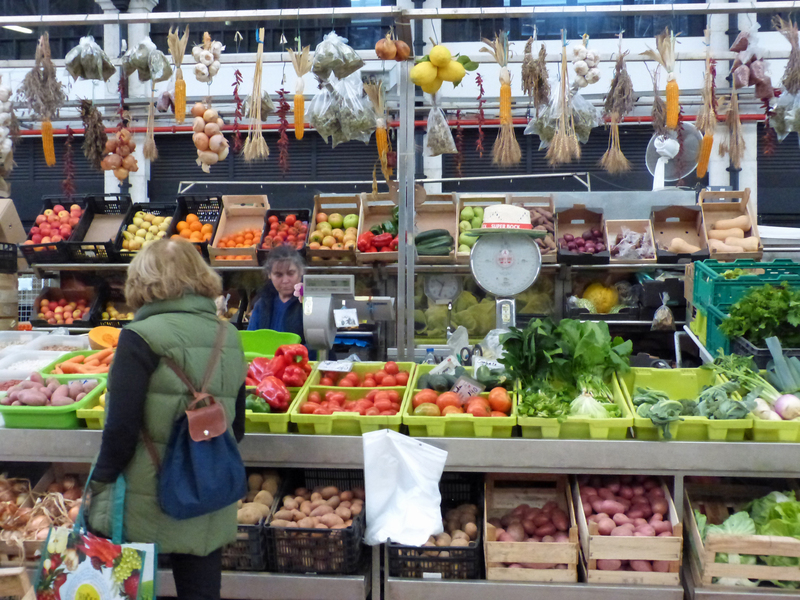 We went to the covered city market where I got fresh fruit and vegetables at very low prices (ex. : huge sweet oranges from Spain for 25 cents each.) That market was about to be closed forever when a publishing company took it over, revived it and turned half of the space into a food hall. Rather like “permanent food trucks” cooks from many parts of the world offer their favorites in small-kitchen booths. This is right on the riverfront so it’s a hit with tourists coming off the big cruise ships that dock here much of the year as well as with local people. 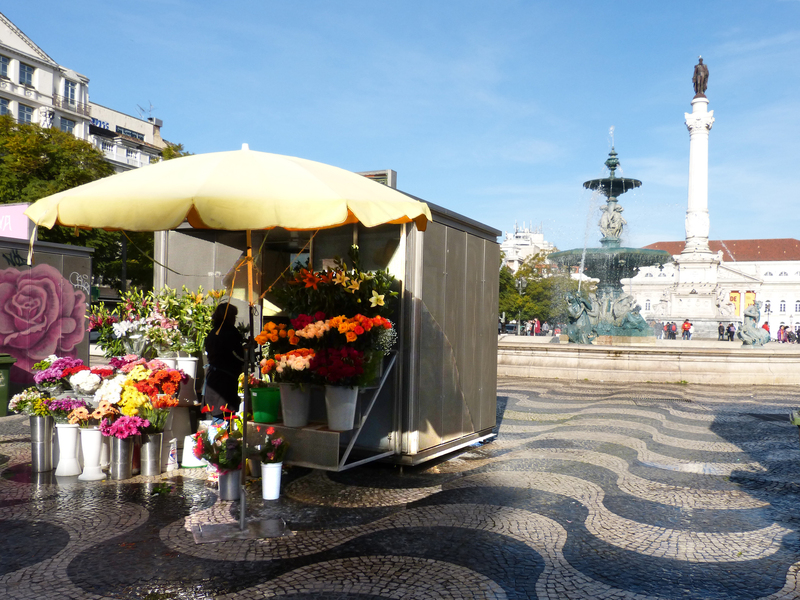 One booth in the Lisbon food market. Next we went to a supermarket to fill the things I couldn’t buy in the fresh-food market. Next Marta took me on a driving tour of the town. Finally we sat with a city map which she marked for me with suggestions, bus details, and other helpful information. She really has made this stop much better for me already and she’s also made me feel more confident as I go exploring. 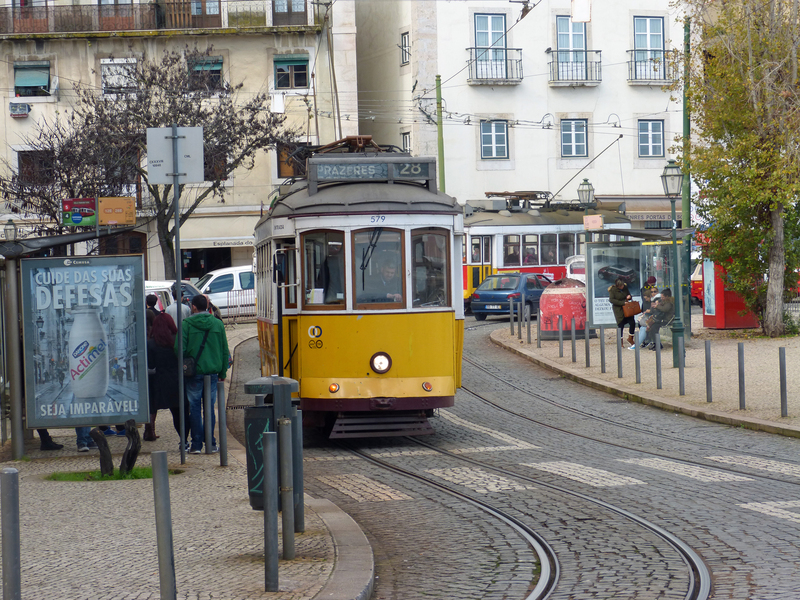 One of several old trams that serve Lisbon’s neighborhoods. Marta had other plans for the afternoon so I set off on my own, following her directions. 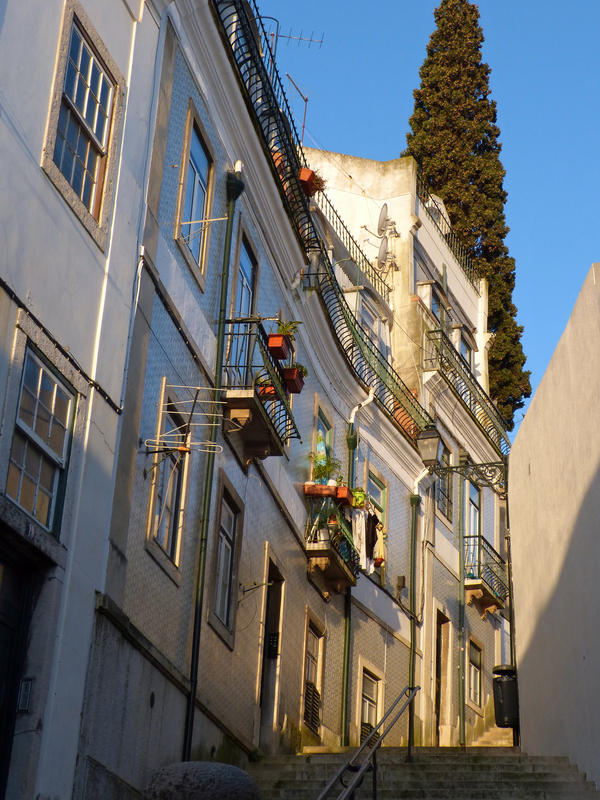 Lisbon’s most famous tourist icon is the ancient tram network that still serve the narrow streets. I boarded the one by my house and rode it across town, then walked much of the way back with camera in hand. This is the “street” on which “my house” is located. 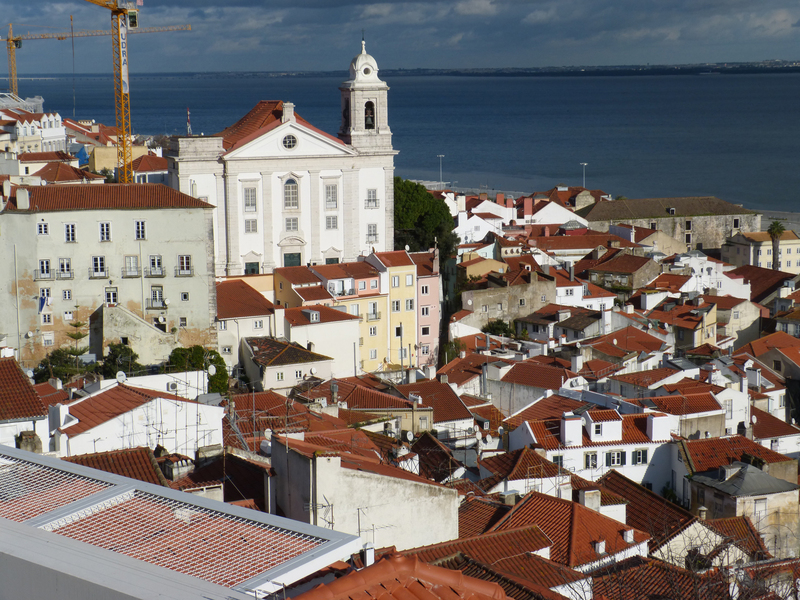 This week I’m staying in the “Alfama” district of Lisbon. This city was wrecked by an earthquake and tsunami in 1755 and most of the old town was replaced in the years that followed. 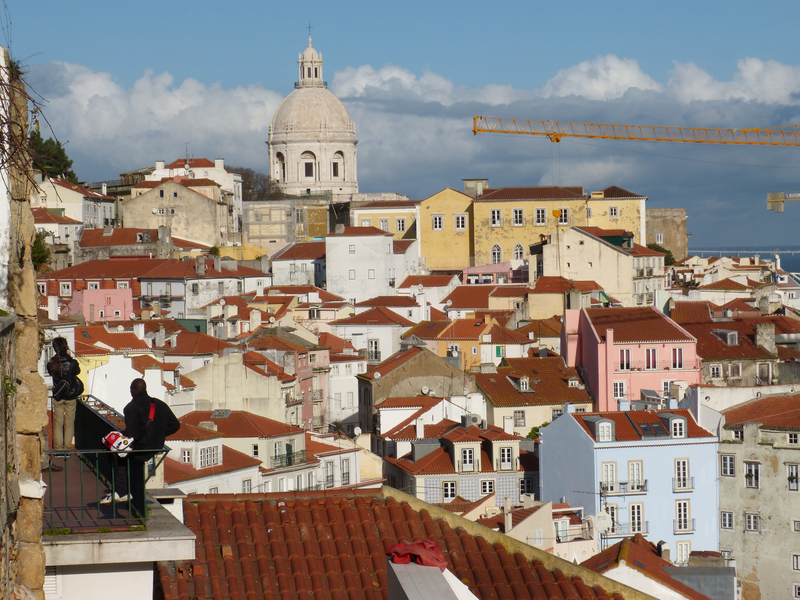 The area called the Alfama was not destroyed and not replaced – it survives today as the oldest section of Lisbon. I am renting a small studio that includes a comfortable bed, a work/dining table and two chairs, a quite complete kitchen and bathroom. (Some of you have said you like seeing where I’m staying so here’s the Trip Advisor page with photos of this place.) 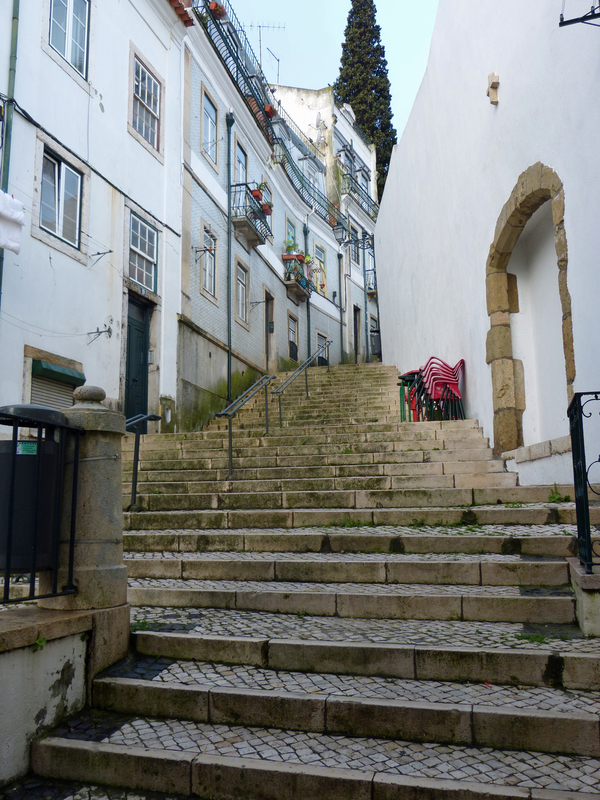 It is located on a street so hilly and narrow that cars can’t come here and the streets are really stairways. This picture and the one at the top of this post were taken from a look-out point directly above the house I’m staying in.